spazsinbad wrote: Regular exercises with our RAN ships the A4G (or other fast jets - even RAAF later on) would simulate the Kennel in a KENNELEX. Thank you very much for all the info, highly appreciated. Apologies - I did not make KENNELEX clear. A FAST JET simulated the Badger (but sometimes a poor old HS748 was used) and another FJ simulated the KENNEL missile. A4Gs would be directed to the Badger (before launch hopefully) by ship radar (MELBOURNE AIR DIRECTION RADAR was excellent for the times - upgraded a few times also). Sometimes MELBOURNE was not involved however other RAN ships were targets or in a picket line defending etc. We also did KELTEX for the KELT replacement missile. Personally I only EVER was a simulated missile in these exercises, other A4G pilots may have info if they were directed after the missile itself but I do not recall that myself. Last edited by spazsinbad on 23 Oct 2017, 01:27, edited 2 times in total. IF you are interested in the OLD fixed wing RAN FAA then a 4.4Gb PDF may fulfill that interest. I'll attach a couple of pages about Badger/A-4s 'together' from it. Elsewhere there are pointers to online info about the USN use of A-4B/Cs as fleet defenders for their ASW carriers mid 1960s. This is what the RAN emulated until the Indonesian Badgers were grounded in early 1970s, however practice for revival of this KENNEL/KELT threat was ongoing. Particularly A4Gs would go after any 'shadowers' because in those days finding ships at sea was 'not so easy'. Whilst the shadowers would be good at staying out of range of aircraft or radar lobes every now and then on exercise they could make mistakes & WHAMMO! Follow the link at BTM my posts here to the RANFAAAA website and follow the directions there for a good result. The attached pages have been reprinted - to reduce the PDF file size (PRN) so any links are gone but should be text visible. NINE minute video about VFC-12 A-4 Aggressor Squadron with SKYHAWK gunsight film - I'll attempt to edit that out. Starts around minute 6 & 25 seconds. The gunsight can only be depressed and it was depressed about 7 mils for guns - so lead! Stuff of much about 'HOW to Deck Land' from 100 years ago to today with the F-35B/C including inbetweenies and such. Plus quite a few pages about the F-35 variants (with info about NavAv because you know - I LIKE IT!) Turn it up to ELEVEN. Probably early next week a segmented .RAR file will be uploaded to Microsoft OneDrive. File will be the same because this file cannot be edited for the moment, viewing is fine though. Use the latest Adobe Reader please. Let me know if you have problems viewing / downloading / whatever. Kriky, just make a website already. Why? This is what I make - PDFs. Why is a website necessary? spazsinbad wrote: Why? This is what I make - PDFs. Why is a website necessary? Easier to search, edit, add media, link to, etc. Perhaps that is easier for you however the 4.4Gb PDF project started a dozen years ago or more when the internet was not what it is today. I learnt some DTP (desktop publishing) along the way to make the PDF as seen today (archivable on DVD hence limit to file size). WYSIWIG WhatYouSeeIsWhatYouGet had great appeal all those years ago whilst HTML was just a maze of bad standards never kept and bulletin boards with dialup modems. I used to POST DVDs to those requesting it and to then have FREE download websites was marvelous, after struggling with various other kinds of download sites was just amazing; although these FREE websites have their issues for non-mobile fone users like me - a true troglodyte. Some good photos - inflight - of this TA-4J with bigger 9,300lb thrust engine making it equivalent to an TA-4F/G/K etc. 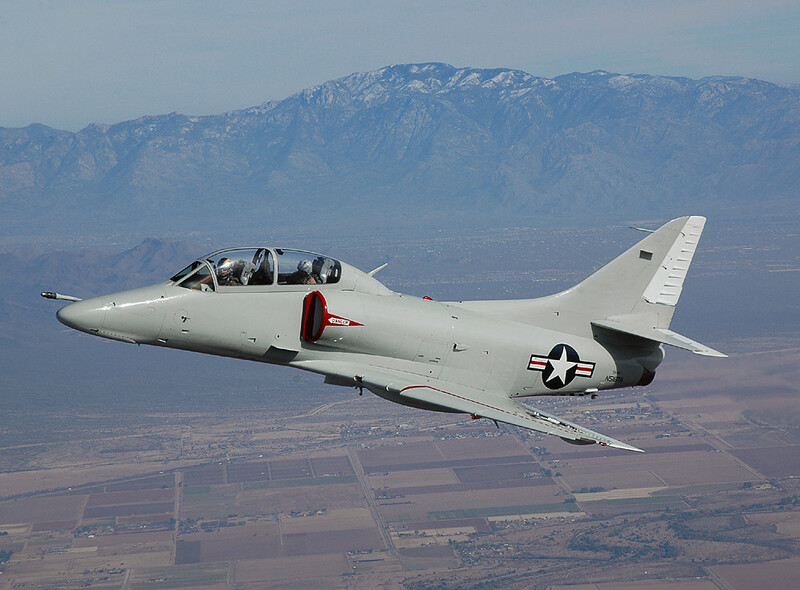 40-45 min in a Skyhawk = $8,000. Don't know about the Phantom, last I heard parts are getting harder to obtain from the USAF. f-16adf wrote: 40-45 min in a Skyhawk = $8,000. They still list the Phantom flight at $15,000 on your link. I spoke with one of their reps about a year ago. He said parts for the F-4D are "becoming harder to come by".